The Vanilla Ghost House is a ghost house found in the Vanilla Dome world of Super Mario World. It can be accessed by completing Vanilla Dome 2 through the Giant Gate. By completing this course, the player gains access to Vanilla Dome 3. Unlike most Ghost Houses, the Vanilla Ghost House does not have a secret exit. It shares this trait with the Choco-Ghost House. At the start of the course, two Eeries will come after the player. A Dragon Coin near a ? Block with a power-up and Circling Boo Buddies can be seen. Mario or Luigi will have to jump from ledge to ledge while avoiding Boos. The player will then see a group of several Rotating Blocks, along with a Big Boo. One of the Turn Blocks contain a Beanstalk that reaches to an alternate route. Using the vine or a cape, they can collect a Dragon Coin and some regular coins, while avoiding a couple of Eeries. If the player chooses the main route, they will find a ? 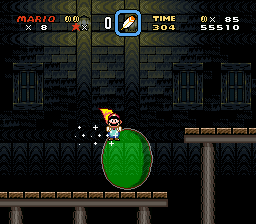 Block containing a power-up, along with a Big Boo. Further ahead is a single Boo and another pair of Circling Boo Buddies, with a Coin Block which will give the player 10 Coins, and a Dragon Coin above it. The player should then enter the door to the right of them. Here, the player will find Big Bubbles floating around. Also, rows of 3 coins spread out the room can be found here. The player will soon see 3 Blocks. The middle one contains a P Switch, while the other ones contain nothing at all. The player should keep moving and not press the P Switch just yet, but should carry it with them. 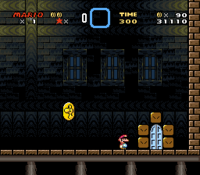 The player will find a regular door here, which will lead them to the platforms with Boos in the first room. However, there is an outline of coins that take the shape of a door. The player should collect them, then hit the P Switch. The player should now be able enter the door. The Giant Gate can be seen here, and the player will now have access to Vanilla Dome 3. This page was last edited on April 9, 2019, at 02:51.